Doug Lamoreux is fast becoming one of my favorite horror authors. He already had me well hooked with his three previous novels: The Devil’s Bed, The Melting Dead and Dracula’s Demeter. I read each of these three in less than two days. If life hadn’t stepped in the way I probably would have raced through in less than one. 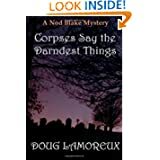 J As soon as I learned there was something new out by Lamoreux, I raced over to Amazon, intrigued by the title ‘Corpses Say the Darndest Things’. This story definitely has elements of horror, but it’s different from the other three in that it has a lighter, almost comedic, side that I found refreshing. Katherine Delp is the wife of Chicago’s biggest, most popular, televangelist. Nod Blake is a private investigator who is hired—against his wishes through his over-eager secretary—to keep an eye on the soon-to-be-dead Mrs Delp. But her death is only the beginning, and the person who stands at the top of the police suspect list is Blake himself. This is only the beginning of Blake’s problems however. A nasty bump on the head seems to have opened a door for murdered victims to communicate with him, and they do so by forcing Blake to live through their murders as if he is the one being killed, feeling every second of their pain as they died. I chuckled through some parts, enjoying the sharp wit of this old style detective story, while flinching through others. The plot remained complex, the characters 3D and fun to follow, as we watch Blake try to get to the truth of what’s taking place. The scenes where he experienced the murders personally were well-written, realistic and definitely able to make me cringe. Every time I thought I knew who the killer was, another bump was placed in the road, tossing everything back up into the air again. I enjoy trying to play the ‘who did it’ game with mystery detective stories, but I admit the twists and turns in this one kept me guessing right up until the end. A fast and fun read that I think fans of horror and mystery will both enjoy. Posted by Denna Holm on January 2, 2014 in Archives and tagged cursed, detective, five stars, Horror, mystery, tension level.